It is doubtful that schemes to refine synthetic gas and liquids from coal will ever be economic, Indeed, only two countries have used such technology because they were desperate for transportation fuels because they were expelled from trading with the civil world. Gas meters will not know the difference between syngas and natural gas that passes through them but customers will see a hefty increase in the price they are forced to pay for syngas if Leucadia's proposed Indiana Gasification plant in Rockport ever becomes a reality. The first was Nazi Germany and later apartheid controlled, South Africa. But that fact seems to escape those who seek giant profits in forcing unwilling consumers to buy their fuels and assume tremendous risks. That is the case in tiny Rockport, a town of a little over 2,000 people on the Ohio River in southwest Indiana. There, a Wall Street based hedge fund called Leucadia National has developed a business plan that would make Karl Marx envious in its arrogance if not its craft. It all started in 2006 when the price of natural gas was increasing to around $13/million btu and seeming gas shortages were feared. Leucadia, working through a former high level Washington bureaucrat named William Rosenberg saw Indiana Governor Mitch Daniels’ initiative called “home grown energy” as an opportunity to put his academic theory of what he called “third party covenants” to the test. Indiana Governor Mitch Daniels had no problem betraying his conservative bonifides when it came to forcing his constituents to ensure that his good friend, Mark Lubbers got rich from the Indiana Gasification proposal at Rockport. Photo © 2007 John Blair. Under that arrangement, approved by several DC based environmental NGOs, the covenant would create business models where the sponsor took very little risk while making ignorant gas consumers pay not only for the capital costs of their private refinery but also obligating taxpayers and ratepayers into long term contracts for their synfuels regardless of what the future cost might be. At $13, the deal looked pretty good, if you believed the assertions by Rosenberg that the gas could be produced for about half that price. Daniels was a believer and dictated to the state’s gas utilities to enter into negotiations designed to establish a price for the syngas that he claimed would provide a “hedge” against future gas increases that he speculated would happen thirty years out, well past his remaining six years in office. Regulated gas utilities saw it differently. They were already aware of the new drilling taking place that they believed would force gas prices down to well below the $10-$12 figure such a plant would require if it were to pay off its capital expenditure to build the plant as well as production costs, especially if they were required to capture and sequester the 4.5 million tons of carbon dioxide the plant would produce each year. Of course, the “conservative” US Congress was again duped into believing the coal to gas fairy tale and passed legislation allowing for federal “loan guarantees” as an incentive to build and demonstrate the technology designed and manufactured by General Electric. That same law became controversial when the feds had to pay off a guarantee for a solar panel manufacturer when the Chinese developed a newer method of building the panels using heavy subsides from the Chinese government. But while that loan guarantee failure was condemned by conservatives, their ire was nowhere to be found when it came to risky coal ventures. After all, this same technology from a different manufacturer was used for a plant in the early 1980s in North Dakota, with a similar loan guarantee of more than $2 billion that went belly up due to huge capital outlays and fluctuating prices for coal. When the deal with Indiana’s gas utilities went astray in 2009, opponents of the plant hoped that Leucadia would go away. But instead, they hired long time personal friend of the Governor, one Mark Lubbers to assume control of the political needs to make the third party covenant work to their advantage. In 2009 the Indiana legislature did something extraordinary. The passed a law putting the State of Indiana smack in the middle of the competition for home heating gas. They directed the Indiana Finance Authority to purchase all the output from the proposed plant at some variable price above $6.60. After purchase, the state would turn around and sell the gas in direct competition with natural gas suppliers in the private sector. The plan was based on the erroneous assumption that the price of gas would stay high, completely ignoring the fact that gas on the open market was in a near free fall as more and more gas found its way to market. At the time this story is published the price of gas at the Henry Hub in Louisiana is selling for $2.18/mmbtu up from less than $2 just a month ago. Daniels and his friend Lubbers assured Indiana legislators that the price of gas was volatile and that prognostications from the Energy Information Administration predicting low gas prices form the next three decades were wrong and that the proposed plant was indeed a wise investment regardless of the facts about the future price of natural gas. But it was not enough for these otherwise “conservative” legislators to make the state compete with the private sector, they also decided that if they could not sell their new purchased syngas as planned due to its high cost of production, they would force Indiana consumers to buy it from the state at a substantial premium that could end up being 200 to 300 percent higher than natural gas on the conventional market. Even Tea Party fav, Indiana Treasurer, Richard Mourdock as a board member of the Indiana Finance Authority gave the arrangement his complete blessing, although that was not a surprise since his first allegiance is clearly to his former vocation as a coal miner. I once described it as the Communist Chinese model of business because of the state ownership of the gas and the authoritarian requirement that Hoosier citizens buy the gas from the state as unwilling consumers. But the bizarre economic model does not end there. This plant also requires a Federal Government Loan Guarantee that was said to be higher than $2 billion in 2008 that was supposed to cover the cost of building the plant. Unfortunately for Hoosier consumers, however, Duke Energy was building a similar plant but designed to use the syngas to produce electricity in a combined cycle plant just up the road in Edwardsport, Indiana. Early on, that plant was sold to politicians at a price of $1.2 billion. To Duke’s customers’ dismay, that plant has ended up costing more than $3 billion and Duke is currently having problems getting it to work as advertised. It is likely the same building cost problems will occur at Rockport since Leucadia knows little about building such a sophisticated and complex industrial facility. Their history as hedge fund capitalists is not a good reference for building a massive new chemical refinery. Most objective observers believe that Leucadia has vastly underestimated the cost of both their product and the to construct the experimental plant. Lately, one of the utilities that will be forced to pass through the syngas to their customers in the deal has come out strongly in an effort to protect their customers from the exorbitant price increase home heating and commercial customers will be forced to bear if this deal goes through. 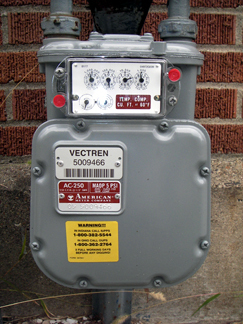 Vectren, a regional gas and electric utility has fought the plant on behalf of their customers for the last year and seemed to be winning by lobbying the legislature to forego yet another $120 million Indiana “tax credit” for Leucadia before Daniels stepped in and said the deal did not need legislative approval and that he would dictate that the tax credits be issued directly by his administration. Sadly, there is another issue which is being ignored by proponents’ zeal to enrich Leucadia and Daniels’ friend Lubbers. That is environmental justice. 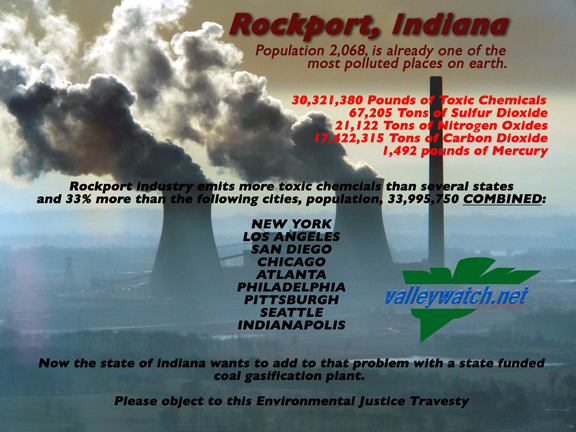 Rockport is already one of the most polluted communities on Earth. Already, two existing industries, AEP’s 2,600 megawatt Rockport power plant which serves the other end of the state and AK Steel together release 30% more toxic chemicals than all of the industry in Atlanta, New York City, Philadelphia, Pittsburgh, Indianapolis, Chicago, Seattle, Los Angeles and San Diego COMBINED, according to the EPA’s Toxic Release Inventory. That is industry that represents more than 34 million people compared with the little more than 2,000 people who reside around Rockport. When confronted in 2009, shortly after he signed the dubious legislation that is the center of the controversy, Daniels quipped that desperate times require desperate measures as he referred to the business model and the jobs it would bring. If it is not a new form of state socialism, it is certainly something close. Some people would rather refer to it as crony capitalism which is an accurate description of the whole deal. Whatever it is called, it is a sleazy, back room political deal that forces people to consume against their will a product they could get could buy for less in the private sector. And all the wile these same people call themselves “conservative.” What a joke! This entry was posted in Uncategorized and tagged Coal, Indiana Gasification, Leucadia, Mark Lubbers, Mitch Daniels, natural gas, Rockport, TRI, William Rosenberg. Bookmark the permalink. 1 Response to What on Earth is the deal with Indiana Gasification? Or how do “conservatives” justify such leftist, authoritarian business models. Only the beginning of a long line of sell-outs we will see from this shady little man. Our state is at the bottom of the heap for social services as well as environmental protection, all because he chooses to bestow favors upon his rich cronies. May the Force deal with him.